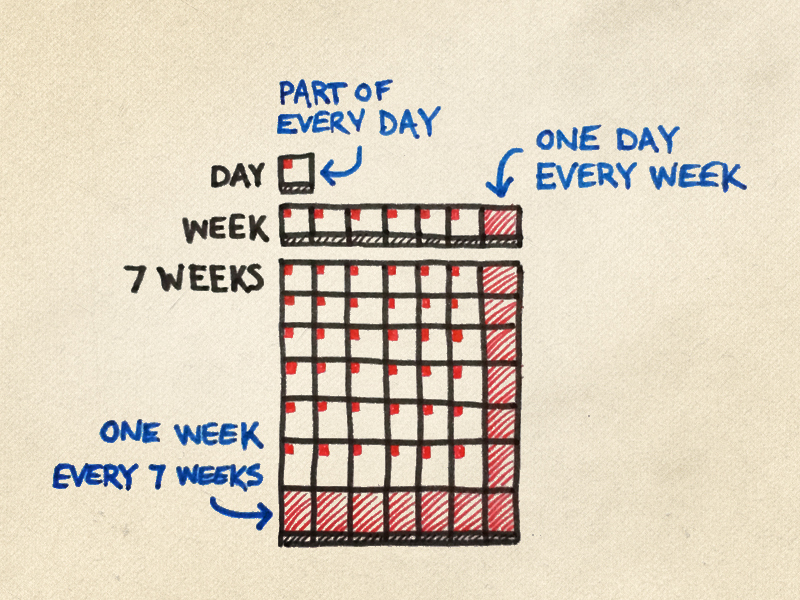 What if You Took a Week Off Every 7th Week? I’ve been doing a lot of things this year. I launched my Learn Lettering courses, I’ve been podcasting twice a week (we just passed 100 episodes), writing every day, working on my book, producing videos, sending a weekly newsletter, and writing 2,000–4,000 words of show notes every Wednesday and Fridays. Somehow I spent 3-months on a massive redesign of seanwes.com while maintaining a physical product business, customer support, and fielding dozens—if not hundreds—of daily emails from real people with burning questions on life, lettering, and business. It’s been a really fantastic year and I’ve enjoyed the rewards of hard work and the feeling of accomplishment it brings. I’ve brought on help and I’m planning to bring on 2 or 3 more people next year. 2015 will be a very big year. One of my goals is to produce a daily video show for which I will have a dedicated video guy on staff. The next big thing for me is a three-part series of business courses that I estimate will take me upwards of a year to produce. In the mean time, I haven’t been slowing down. I haven’t done any lettering lately and I’ve been missing music (both piano and electronic music production). I recently bought a kalimba as a way of satiating my need to create music—which you might have heard me play at the end of recent podcast episodes in our fun little Zen Moments With Ben sessions. As much as I enjoy business, writing, podcasting, and helping the other entrepreneurs within my Community membership site, I’ve been missing my other creative outlets for which I’ve made no time. Back in May of this year, I did a podcast on Small Scale Sabbaticals (e072). What if you took a moment out of every day to step back from your work and really think about it? What if you were really purposeful about evaluating what you’re doing daily and where you’re at? What if every 7th day, you took a whole day off to do the same thing on a slightly larger scale? Why would you ever take time off when you love your work? If you love what you do, what’s the point of breaks? The good thing about taking a step back and taking some time away is absence makes the heart grow fonder. It gives you even more fervor and passion going back into it. In the episode where I debuted Small Scale Sabbaticals, I further expanded on the concept of the weekend break and theorized about the idea of taking a week off every 7th week. I have never done it in practice, but I really like the sound of it. I’ve finally decided to do it. It’s going to be time away from my regular output like podcasts, articles, videos, and newsletters. When I say “take off,” I mean alleviate myself from regular commitments in order to create and be productive in other ways that will recharge me. I may at times also use a sabbatical week to travel while doing the above. Besides design, lettering, and business, music is one of my very biggest passions. I have a piano in my office and I still play piano almost every single day, but it’s not as often as I used to. Certainly not as often as I’d like. For many years I’ve had a goal of producing an album (both for my original piano compositions as well as for electronic music). I’ve realized that it will never happen unless I make it happen. I don’t have time to compose music. …and I never will until I make the time. I have a hard time slowing down—it feels unproductive. Subscribers know that I am prolific in my output. I make a point to be relentlessly consistent. We have this inside joke within the Community. Everyone calls me a robot. We even have a custom robot emoji for it. But the thing is, I’m not a robot. When I still myself enough to listen to my body, it’s telling me I’m heading towards burnout. Can I keep going at this relentless pace? Yes, but for how long and to what inevitable demise? Extreme consistency in output is 1 of the 4 Keys to Growing an Audience, and introducing stutters in the output seems unproductive. But you know what’s even more unproductive? You know what’s even more detrimental to your audience? The best remedy for burnout is prevention. Slowing down before you hit that devastating point. If I’m honest, I know I’m headed there. I may seem like a robot, but I’m not. In fact, it may even be better for my audience to be reminded every 7th week that I am human. To be reminded that personal health is just as important as showing up every day. Coming up with two highly relevant, highly valuable podcasts a week is pretty exhausting. I can do it, but there’s barely any breathing room in my week—even with a buffer episode. I can keep doing it, but could they be better if I made a habit of regularly taking a step back? Having this “down” time would allow me to plan the next 6 weeks of work. I could plan the upcoming podcast topics to align in a more cohesive fashion—possibly even conceive of longer series. Taking a week off initially seems unproductive. It’s a week of not working on my primary pursuits. But how productive are those hours I spend working? How effective are they really? As much as would like to think I have robot-like efficiency, to truly believe this is fooling myself. Take some time to reflect. Think about your now. This is something that seems so simple, but something I don’t often do. It’s great to have a vision of where you’re going and where you want to be. Doing one small thing every day towards your goals is very important. But it’s easy to get caught up in where you want to be eventually and aligning every single day-to-day thing with getting there. The problem is that “eventually” never comes. That’s not to say don’t work toward your goals, but if all you do in your day-to-day is 100% focused on the future, you miss life. Maybe not everyone has this problem. I think I do because I’m so chronically long-game minded. This of course is advantageous because every decision I make is centered around what will benefit me 10 or 20 years from now and I’m already starting to see the returns on hard work I put in just 2 or 3 years ago. But when 100% of my day is comprised of long-game-oriented efforts, what’s left? There’s something to be said for the balance of now and later. I need to re-center myself and allow myself to be fulfilled in the moment. That means telling myself it’s ok to create music for the joy of it. Dare I say it, it’s ok to be “unproductive” sometimes (I wanted to backspace that last sentence, but I’m forcing myself to leave it). Long term goals are important. But in the end, all we’re given is now. While you plan for the future, do what you can to make sure you enjoy the process of getting there. Life isn’t about a destination but the journey. This is all just a theory. Most people take off one day a week. I try to at least do that much. I don’t always succeed. I’ve also heard of others taking off every 7th year. I intend to do that as well. But I’ve never heard of someone taking off every 7th week. I don’t know if this will work in practice, but the beauty of experiments is that they’re just that: an experiment. If it doesn’t work, it doesn’t work. I’m going to share the results either way. I want this to be a learning experience for everyone. Thanks for your support. I’ll keep you posted on how this goes. Here’s to making time for creative pursuits. UPDATE: Read how my first Sabbatical Week went. Update #2 (One Year Later): Hear How Small Scale Sabbaticals is Going Now After a Year!